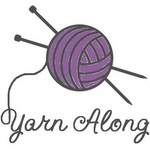 I've so missed sharing about books and knitting! I'm sort of sneaking in here with just the wee, tiniest bit of knitting so that I can maybe get back into that happy rhythm--of both knitting and of Yarn Along. My elbows are still ridiculously sore. Ironically, they were somehwat better in Florida, despite carrying Sarah everywhere. I attribute that to nearly no driving, no phone, no texting, and no keyboarding. I sat last night and just knit a few rows of a simple washcloth as I get used to the new needles and test their effect. My first few rows were a little looser than I like but the later rows are very nice. Promising, promising. I'm juggling books right now. On my Kindle, I'm reading Twyla Tharp's The Creative Habit and How to Be Like Walt: Capturing the Disney Magic in Your Everyday Life. Tharp's book is a very interesting tutorial on cultivating creative habits. I read it as much for the opportunity to crawl inside a choreographer's brain and understand better a dancer as to explore creativity in general. I've learned a great deal and would highly recommend the book to anyone wanting to think more deeply about creativity. The Disney book is excellent. I plan to make it required reading for all my teenagers. Disney was a fascinating man. The book is a witness to his hard work, perseverance, and understanding that he was created to create. I wish I'd read it before our Disney trip, because it puts some things in context, but then again, it has already inspired me to go back and look even more closely. New on my nightstand (it was just released yesterday) is Quiet: The Power of Introvets in a World that Can't Stop Talking. For the life of me, I cannot remember where I learned about this book. I'm utterly fascinated. As an introvert who is still reeling a bit after a very extroverted vacation, it's nice to read a book with such appreciation for the strength of people who "listening to speaking, reading to partying; who innovate and create but dislike self-promotion; who favor working on their own over brainstorming in teams." I've just begun to read, but I know I'm going to learn a great deal about myself in these pages. There! I got to share; I feel much better now and I'm grateful to Ginny for the opportunity. Now go visit her and get more great reading and knitting news.